Chris Nash will again captain Sussex this week as they take on Leicestershire in the County Championship - but the batsman has remained coy on the chance of him taking the role on full-time basis. The 34-year-old stepped in as skipper last week and oversaw victory against Worcestershire after former England batsman Luke Wright relinquished the role hours before the game. 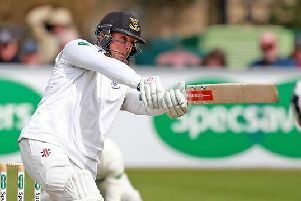 Nash has captained the county in multiple formats of the game during his ten-year spell at Hove and will take the reins again at Grace Road tomorrow with current vice captain Ben Brown out injured with a broken finger. When asked whether he could take on the role on a permanent basis, Nash said: “We will have to see what happens, I enjoyed it last week (being captain), but we will have to cross that bridge when we come to it. “At the moment, the most important thing and what we have to do is keep winning games. On the back of sealing victory over Worcestershire on Monday, Sussex lie fifth in the table and are aiming for their third win in four games in the four-day format. Luke Wells posted another score of over 150 during Sussex’s big first-innings total of 579 for 8 declared, whilst Wright (87), Harry Finch (82), David Wiese (66) and Stiaan van Zyl (54) all hit half-centuries. Six wickets in the match for Vernon Philander, five for Jofra Archer and four for Wiese helped Sussex bowl Worcestershire out twice to win by an innings and seven runs. Sussex are unbeaten in their last six matches against Leicestershire, and have claimed wins in each of their last three away games against the Foxes. Steve Magoffin, who began the game against Worcestershire but suffered an Achilles injury during the visitors’ first innings, is now ruled out for six to eight weeks. Laurie Evans, Matt Machan and Ollie Robinson are all making good progress from their respective injuries, they are not yet fit enough to be included in the squad. Left-arm seamer George Garton, who has been in action for the England Lions, replaces Magoffin in the squad whilst all-rounder Delray Rawlins is also included. Philander, who took match figures of 6 for 102 in the last match, plays the final game of his overseas stint. Sussex: Jofra Archer, Danny Briggs, Michael Burgess (wkt), Harry Finch, George Garton, Chris Jordan, Chris Nash (c), Vernon Philander, Delray Rawlins, Stiaan van Zyl, Luke Wells, David Wiese, Luke Wright.